I don’t have a right or wrong answer to this question, because the answer depends on a few key items. However, I will try to give you some tools and information that you can use to answer this question for your specific situation. First, I will say that I highly recommend that as a civil engineer you pursue your professional engineering license. I know that some people will argue that it is not necessary in their specific discipline, but I think this is such an important credential for so many reasons. Of course, the P.E. license gives you the ability to sign and seal design drawings and specifications, but it also adds to your credibility and reputation tremendously. Even if you may not use the P.E. license immediately, you never know when you will need it, and it is easier to obtain it earlier on in your career because the technical material is so fresh in your mind. That being said, let me give you a framework for deciding which credentials are most important to you at this stage in your civil engineering career. 1. What are my primary career goals as a civil engineer? Let’s say you want to become a partner in a civil engineering firm or own your own firm. Then it is critical that you obtain your P.E. license. However, if you want to become a professor of civil engineering, maybe it makes sense for you to focus more on a Ph.D. right now. I recommend answering this question by doing a brainstorming process and writing down your goals on a piece of paper. 2. What credentials are important in my specific discipline of civil engineering? There are many disciplines in civil engineering, and your discipline will likely determine your credential plan. For example, as a geotechnical engineer who works on sites, maybe there is an OSHA or inspection credential that you should obtain. If you do stormwater design, then maybe you want to pursue a certain stormwater certification. These industry specific certifications can help you build your expertise in your field. 3. Ask someone who has achieved your goals. Find a civil engineer who has achieved similar goals and ask them what credentials were helpful to them. Yes, times change, and if they are much older than you, the same certifications may not be applicable. But it’s certainly worth having a conversation and seeking their advice, not just on credentials but on general career items as well. I welcome your reactions in the comments section below. Share any follow-up questions this may raise, or steps that you have used to decide which credential to pursue. 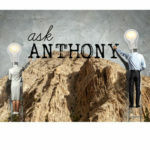 I’m also eager to receive your questions on any career-development topic. Offer them in the comments below or send them to me at Anthony@engineeringcareercoach.com. What did you recommend for anyone like me that have many years since graduated? How someone that doesn’t have the knowledge of a civil engineer like those with degree in Construction Management can lead the way in the construction industry? Thank you for your article. 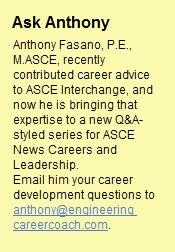 I would like to add that ASCE has credentials that can be earned after receipt of the P.E. license. I agree with your assessment that the P.E. license adds an extra layer of credibility to someone’s knowledge base. I believe the post-licensure certifications that ASCE offers do (or are trying to do) the same. They’re not available in every field, but if you are a coastal, geotechnical, ocean, port, navigation or water resources engineer – they are. Seeing a P.E. after someone’s name doesn’t let you know their area of expertise, or even that they’re a civil engineer. If you see a D.GE (Diplomate, Geotechnical Engineering) after someone’s name, you can be assured that they have extensive experience in geotechnical engineering and this experience and education (Master’s degree) has been vetted by a group of their peers.